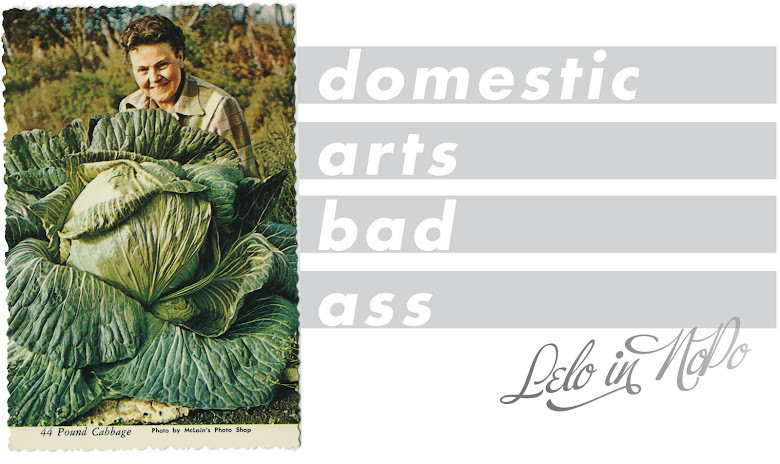 Lelo in Nopo: Dare to be different with your holiday meal! Basically you boil the crap out of some green peppers (I'm imagining bell peppers), butter up some cooked onion, mushrooms (from a can? ), and ham (because nothing says Mexican food like ham), and add some brown sauce to the mix. Brown sauce? According to my researcher on the topic (thanks mom!) it's a butter, red wine, beef bouillon sauce with tarragon and thyme. I guess in 1935 you just had brown sauce on hand. Perhaps you make it while you're boiling those bell peppers. But the creme de la creme, or should I say, muy sabroso, ending is serving it all on toast. I wish I had a photo of AdRi's face when I read this recipe to her. I bet it's the same face you're making right now too. OMG - reminds me of the "Spanish" stuffed bell peppers we made in the '70s! 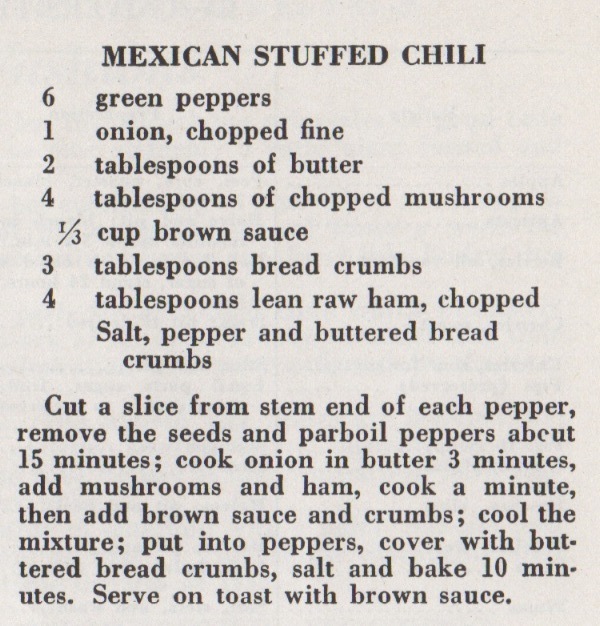 The recipe actually is way less alarming than my first quick read of the title, which suggested chiles stuffed with Mexicans. Surely we can rehab this recipe. Just a couple of tweaks, and it could be great! Rather than goof on the cookbooks of the past, can we figure out what was attractive about these dishes, and update them? I would take a picture of my face and send it to you, but I'm pretty sure it would curdle your morning cafe con leche. This makes me sad. During my vegetarian days my friend would make me (in lieu of turkey) poblanos stuffed with nuts, raisins, veggie chorizo and topped with crema. They were tastier than any turkey I've ever had. yummo lelo. there has been a MAJOR achievement in my life. check out my first post in a long time please. you, jayne, adam were my first blogger buddies. owe at least some of it to you all !! Jack, there is no redeeming quality in this recipe. Sorry. And wait. Are you giving editorial feedback? !